While brainstorming hack ideas, most espionage themed, the team got hungry. Needless to say, all clandestine activity was abandoned. Burritos ensued. DABurrito has two main parts. The first is a machine that additively manufactures burritos (think 3D printing). 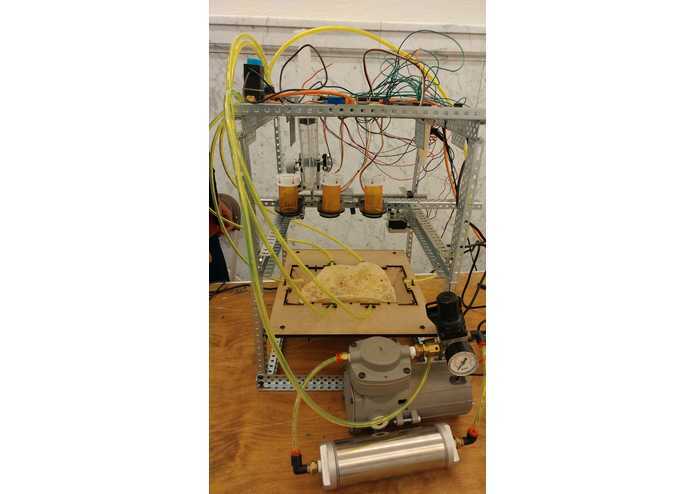 Given a tortilla and some ingredients, the DABMachine is capable of constructing a custom-made burrito, placing hot-sauce, beans, rice, and other ingredients on the tortilla to your liking. The second is an app for iOS and Android that allows you to purchase burritos from other people's machines. The nearest machines and the cost of the burritos from each machine are displayed, allowing you to choose the burrito that's best for you. This allows anyone in the world to be a burrito chef. Think Uber, crossed with AirBnB, but for burritos. We started with a dream. This was quickly replaced with a steel scaffold. On this, a burrito trough, which we CADed and laser cut, served as the base for burrito production. We mounted a RaspberryPi, two Arduinos, and several stepper motor controllers, all of which served to control custom designed burrito manufacturing tools. These formed a material deposition system with a moving head to distribute food material. Delicious, delicious food material, stored in CVS pill bottles, with a syringe for hot sauce. As with all great burrito stories, our road was paved with delicious and not so delicious obstacles. Our initial design for the machine focused around iris diaphragms that would open to release food. These were CADed and laser cut (and reCADed, and re-laser cut, ad nauseum), but in the end turned out to be unusable due to imprecision in the cutting process, despite the team and the Rapid Prototyping lab's best efforts. The pneumatic system intended to fold the burrito was also too weak to do the job, leaving consumers with one last task to do before enjoying their meal. Just half an hour before submission time, the Arduino controlling toolhead movement and sauce extrusion short circuited, leaving us with fewer pins than necessary. Most of the software and APIs we used were new to us, and it took us a while to get our bearings. Many problems that consumed hours arose from small details, like getting maps to display concurrently with location and price data, or the many hoops jumped through in order to SSH into the team's RPi. We're most proud of the hardware we built. Though hardware is hard -- as the name may imply -- we were able to develop a complex set of motors, essentially building a (delicious) additive manufacturing device from scratch. The fine parts that we CADed, cut, and put together took time and effort, but functioned well after our first hiccups with the iris design. Though we were glad to take on such a difficult hack, it turns out simplicity really is golden. We frequently had to change our plans due to both mechanical and digital constraints, often reverting to a simpler (though a wee bit less beautiful) solution to the same problem. In essence, we've proven that it's possible for everyone to afford a personal chef. Granted, not every food is a burrito, but many foods can be made in the same way. The additive manufacturing process can be generalized to everything from cakes to pizza to curry, and we'll be the ones to do it. Some personal robotic chefs are coming to market, but these generally cost tens of thousands of dollars, as they try to mimic haute cuisine aesthetics and full human actuation. However, as we have shown, much of the food they make can be cooked and assembled by inexpensive, non-humanoid robots. I developed the front-end and handled networking. The front-end was developed using Expo and exported to naive iOS and Android. Networking included integrating Hasura Baas and authentication, managing the database, setting up the client on the raspberry pi, etc. I designed and built the device itself, the superstructure, and all of the moving mechanical components of the device, including the topping dispenser, sauce extruder, translation stage, and pneumatics. I also assisted with developing and debugging the RasPi code.